Browse by brands & reviews. Call now to book a tech. The Samsung SMT- i5230 IP handset is the second model from the top in the SMT-i5200 IP handset series and makes a great manager or executive handset. The Samsung SMT- i5230 IP handset is the second model from the top in the SMT-i5200 IP handset series. It differs from the top of the line SMT-i5243 in that it doesn't support the optional Video, Bluetooth or camera connectivity, has a smaller monochrome screen and has less function keys. The reality is that most users will never miss, nor need, the optional functions that come with the SMT-i5243. To us the only real benefit of the SMT-i5230 seems to be the 5 programmable buttons at the bottom right of the handset. There are actually 7 buttons but the top and bottom are actually up/down arrow indictors. Within this you can program up to 99 buttons to scroll between. In general use this is not overly effective as you have such limited visibility of only 5 items at a time. Yes it's great that these buttons are fully LCD and don't require paper inserts but most normal users would be better served losing the LCD capacity and having more visible buttons at a glance as offered with the Samsung SMT-i5220. That model has 24 visible buttons on the handset which is more than enough for most SME reception handsets as well as heavy users that need to see people easily. In fact apart from the paperless LCD and the 99 versus 24 programmable buttons these are the only real key differences between the i5230 and SMT i5220 phone handsets. Next to the 5 keys there are busy light indictors than offer 3 different colours to distinguish whether users are busy, free or in a meeting on DND (Do Not Disturb). Like all Samsung SMT-i5000 IP phone handsets the SMT- i5230 IP phone is designed for IP environments. This means that you can connect the SMT- i5230 to any working Ethernet port and it will automatically register on the OfficeServ phone system. Also there are 2 Ethernet ports (both 10/100MB) so you can use the one port for both your office phone and your PC. There is an optional SMT-A52GE Gigabit Ethernet Adaptor for larger companies or if you are looking to migrate to a Gigabit environment in the future. IP handsets are also great for hot desking and remote users. By logging into an available VoIP phone with your credentials it will automatically bring over your customised user settings, extension number etc. The call quality is excellent on the SMT-i5230, as with any IP phone handset that supports wideband audio. The G.722 wideband Codec delivers a premium VoIP call user experience and extends to the handset mic and speaker also. For basic IP phones without wideband audio, users can find certain sounds harder to distinguish as the full vocal range is compressed to narrow band audio. The Samsung SMT-i5230 phone offers 4 soft keys below the screen. These are context sensitive and change depending on what the user is doing on screen. If you are retrieving voicemail for example, it will present the user with intelligent options pertaining to voicemail access like delete, save, replay etc. In total there are 4 feature keys as well as the 99 programmable keys which we have discussed. If you need additional visibility for users you can always attach a SMT-i5264 AOM console with an extra 64 buttons. This counteracts having to scroll up and down between the 99 programmed buttons. There is a jog dial button in the middle SMT-i5230 handset and this has also become standard on not only the SMT-i5200 IP series but most IP handsets. This makes navigating speed dials, redials and other functions very straightforward. Samsung has also intelligently broken up call function keys and system function keys. System functions like conference, phone book, voicemail etc are all in one section next to the jog dial. Near the keypad you find the on call functions like mute, volume etc. This is a clever deviation from most handset designs. One of the great features of all Samsung handsets is you can easily customise the SMT-i5230 handset yourself with their proprietary Samsung Easyset application. OfficeServ Easyset is a Windows Browser and is very easy to use. With a PC display you can customise features like divert conditions, extension BLF, divert target, personal speed dial etc with the click of a mouse. This means that you don't need a system administrator to affect basic user customisation on the Samsung SMT - i5230 IP handset. So the smartest choices for most SME companies are probably not the SMT-i5243 phone or this SMT-i5230 IP model. Most users should check out the SMT-i5220 and the SMT-i5210 for day to day users. With the OfficeServ pbx you can also attach the more basic Samsung SMT-i3000 IP phone series like the SMT-i3105 and SMT-i3100. Being a hybrid pbx system you can also connect phone handsets as well as wireless IP. If you already have two points cabled to each desk from previous systems, phone handsets are an excellent way to reduce costs. If you're interested in phone handset options then look at the Samsung DS 5014 or the more featured Samsung DS 5021. Infiniti telecommunications is not affiliated with the manufacturer of this product in any way. 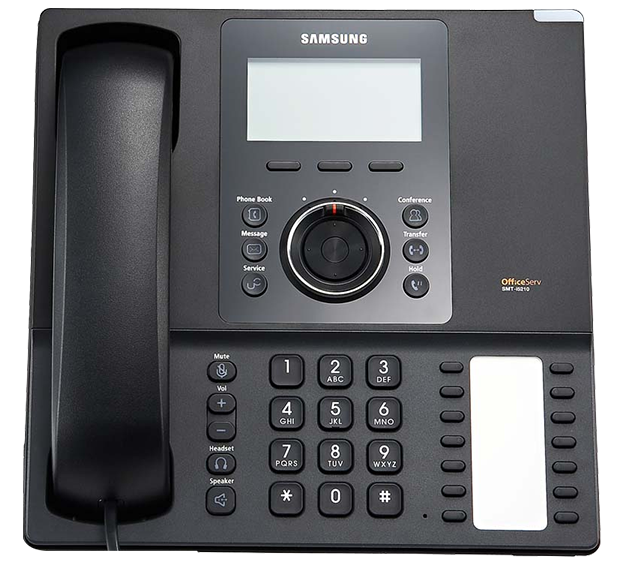 For technical specifications of the Samsung SMT-i5230 VoIP phone please refer to the comparison table below showing all models in the Samsung SMT-i5000 IP phone series. Looking to learn more about Samsung SMT-i5230 IP Phone Handset? G J Callaghan & Co.
Infiniti organised the installation very well making it a simple process. The technicians were thorough and know their product well. Technician (greg) was very personable and efficient - everything is going great after the changes. So far so good haven't had any issues since Neil has been out- he is always really thorough one of the best techs we have ever had really knows the ins and outs of the system and doesn't come out and waste our time. Our new system is working extremely well. The installation went smoothly and the technicians gets a 9/10 rating. We can highly recommend Infiniti. out more about your industry. Infiniti Telecommunications Pty Ltd. All Rights Reserved. After completing the form below, one of our phone systems experts will call you back to discuss your system needs. Have a question you want answered or looking for more information? We can help, fill in the form below and we will be in contact shortly. Looking for help to find your new phone system? Enter a few details below and one of our new phone system team will give you a call back to talk through your options. Enter a few details below and one of our team will give you a call back to talk through your options. Enter a few details below and one of our team will give you a call back to arrange a discussion in person.